The Dining Room Became the Kitchen! Hard to believe the image above is the same space - in the same house! 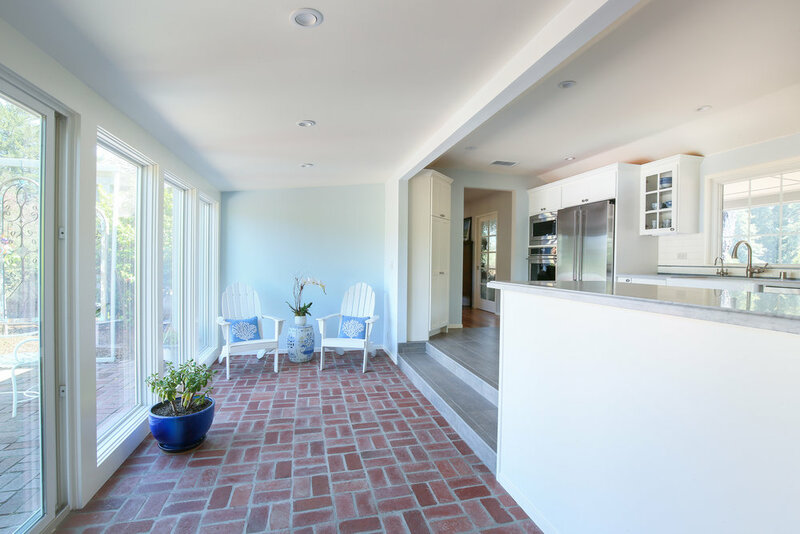 The homeowners wanted a larger kitchen, and it was important to maintain the architectural integrity of the classic ranch home. They wanted something that felt like ‘it had always been this way’ and not something that was out of character for the classic period style of the 1940’s, when the home was originally built. One of the critical design elements of the California Ranch home and floor plan, was the connectivity to the outdoors; ranch homes designed and built in the Pasatiempo area of Santa Cruz had the influence of William Wurster, who was known for how he artfully connected the exterior patios with the interior of the homes. He often designed a loggia or gallery with tons of windows and sunlight that brought the outdoors in. The homeowners felt cramped in the small square kitchen, which stepped down from the dining area, and even though it had a ton of light, it felt too disconnected to the rest of the home, and wasn’t functional for entertaining. In case a kitchen remodel isn’t a big enough project to wrap your head around, moving or relocating the kitchen is an even bigger deal; and this one was no exception. The main concern about moving the kitchen to the informal dining space, was that the floor height was higher by about 7” and with a ceiling that continues sloping down, the homeowners were concerned that their view out the back windows would be negatively impacted. Since relocating the kitchen meant that you’d be able to see it from the moment you walked through the front door, the homeowners wanted the view to the kitchen to draw you in, and make a subtle, but beautiful statement. Careful detail was given to the size/scale of the cabinetry details, the countertop details, the accent tile placement, and the hood design. Working with different ceiling heights and details was critical in designing a hood that didn’t dominate the wall and make the nearby cabinets feel short. We wanted every detail to coordinate nicely and the exact placement and sizes of finishes were regular discussions with the homeowners, the contractor, and our specialty trade contractors - proving that teamwork really does make the dream work! For more project photos, check out the Classic California Ranch.